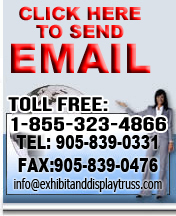 Exhibit and trade show 20 x 20 display truss system designs can be used for structure and decorative accessories. We offer a broad variety of truss designs and sizes as well as custom truss systems that are fast and easy to set up. Our truss designs are available as flat, triangular, or square in terms of its chords. You can also choose from different truss profile sizes depending on the size and stability needed for your truss system. 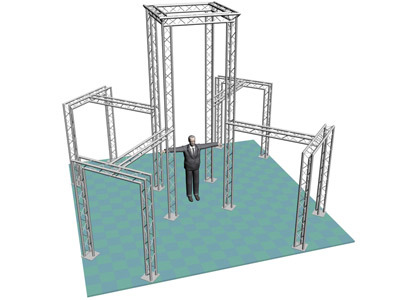 This truss system has a great design for being seen anywhere inside of a trade show room. This truss structure is hard to miss with it's 20 foot high tower.